11 Feb 2019 - A China-specific data package has recently been added which allows you to bypass the Great Firewall. It's $240HKD for a 5GB data package valid for 2 years, which is double the price of the standard 5GB 2-year package. Is it worth it? Personally, I don't think so - despite the additional hassle, I think it's worth arranging a VPN for the time you're in China. The biggest restriction around this is that it's a China-specific data package and it does not appear as the data can be utilised outside of China. I can only imagine this being worthwhile if it happens to be cheaper than a China-specific data solution, or if you regularly go to China on separate occasions, where signing up for VPN separately would likely cost more. Deal Rating: 7/10 - It's a pretty good deal with several factors dragging the rating down. Having said that, for its niche, I think it's a great deal. The highlight of this deal is the ongoing cost of data, coverage and validity. HKD$120 (~$15 USD) for 5GB valid for 2 years, usable in 70+ countries. Pokefi is a WiFi Modem that I have been aware of for about 3 months, but have only recently started using. Putting aside the funny name (it sounds like a Pokemon...), I think we might have a pretty valuable travel accessory on our hands. Unlike other WiFi eggs/hot spots/modems, whatever you want to call them, this device is for purchase and as far as I am aware cannot be rented. In a nutshell, this is what you get upon purchasing the device - I will talk about cost in more detail below, because it can cost anywhere from (figures in HKD) $990 to $1350. Nothing ground-breaking so far. If anything, even if you manage to buy it for its cheapest price of HKD$990, it's still reasonably expensive for 5GB of data. Where Pokefi really shines is in its data packages. I am highlighting the 5GB data with 2 years expiry because this is what I consider to be the primary highlight of the product. I'll talk a little bit about the concept of the product, as well as my experience with using the product so far. As I mentioned above, it's a WiFi modem - no different to one you would typically rent, but in this case you purchase it and own it. You get 1 year Hong Kong warranty which is obviously not of great use to those who don't reside there. The device itself claims to provide "up to 12 hours" of usage - which I found to be not too far off the mark from my 3 days of usage. My understanding of the hardware is that it utilises eSIM technology, which at this point in time is relatively limited in scope, with the most prominent example being the Apple Watch Series and the dual SIM functionality of the recently released iPhone series - where the second SIM is actually an "eSIM", or virtual SIM. Pokefi is the same - that is, it does not hold any physical SIM card and has no SIM card slot. It connects to local carriers within the country you are in to connect you to a local network. Check "status" - single tap while the device is on - note the colour of the WiFi signal. If tap results in no response, device is either off or out of battery. Other functions on the device are otherwise controlled via a specific webpage (not app!) only accessible on a device connected to the Pokefi device, http://a.pokefi/. For the more techie out there, this is the equivalent of loading http://192.168.0.1 or similar page to access your wireless router's "admin" page. The home screen looks like this. This is not compulsory. "Identification" in this case refers to if you happen to lose your device with a remaining and active data package, if you purchase a new device, they can transfer your data package over to the new device. First things first, a question which is probably on most of your minds in the context of China is is it still subject to the "Great Firewall" of China? Yes it is. To access the likes of Facebook, Youtube, Instagram, Snapchat, you will need to have your own VPN to access this. Personally, I found this website useful for recommending VPN services in China. It's best you set this up before you get to China as it is most likely going to be much harder to access in China. I'll break this down into the Hong Kong experience followed by the China experience. Great. 9.5/10. Fast, stable, and no different to what you'd expect from your typical local SIM in your phone. 0.5 points docked because of the slight instability between the Hong Kong and China border (Lowu). I don't have too much more to add because it was honestly as stable as you can get, but for a little more context, I used it for approximately a total of ~3 hours in Hong Kong on a train between HKU station and Lowu to get to the Chinese border, followed by a train ride a few days later from Lowu to Sheung Shui, and a bus ride from Sheung Shui to HKIA. Where it started to be unstable was between the Hong Kong and Shenzhen border, physically walking through at Lowu. I suppose the only way you could "beat" this experience is by having a local Hong Kong SIM that gives you roaming data in China, thereby also allowing you to bypass the Great Firewall while having a fairly consistent connection from Hong Kong to Shenzhen. 5/10. It was honestly quite a frustrating experience. The primary frustrations around using Pokefi in Shenzhen were just simply around not consistently being able to connect to a local network. This is not a frustration with the Great Firewall. The issue is there are two levels of dependencies with Pokefi in China. The first appears to be that the signal between Pokefi and the local network, which seemed to be China Mobile, does not appear to always be available, for reasons unknown to me. The second is the Great Firewall - which is admittedly a completely separate issue, but adds to the frustration. Interestingly, WhatsApp is supposed to be blocked, but when Pokefi had a data connection, WhatsApp messages generally seemed to be coming through and sending out fine albeit inconsistently. It would work for 25 mins, then not work for a while until I switched off my phone's WiFi and turned it back on. WhatsApp media (voice clips, photos, videos) for some reason couldn't be downloaded though. This was not an issue with my device, as I was successfully connected to the Pokefi device itself, but Pokefi was not getting a data connection. When Pokefi had no data connection, it was basically like tethering off a phone that has its data connection off. I was attempting to use a VPN sporadically (VPN.AC), but my priority for the most part was just trying to get a data connection on Pokefi, which was a challenge in itself. VPN generally seemed to work for me, and served its purpose of allowing me to use Google and Google Maps. All in all, Shenzhen was a real challenge for Pokefi. The Great Firewall is an additional layer of complexity, but even putting that aside, I wasn't able to get a stable data connection. Keep in mind China is massive and I was only in one out of how many cities in China? So your experience may well be very different. I've recently done a bit of travelling and have now tried Pokefi in Kuala Lumpur, Penang, Xi'an and Harbin. I was pretty excited to use it in Xi'an and Harbin because my experience of using it in Shenzhen was mediocre, at best. For Malaysia (Kuala Lumpur/Penang), I'll give it a 9/10. It loses a point because it seems to momentarily drop out, albeit not often. The drop out also seems to be very very brief. I also had one (out of maybe 10?) situations where it didn't seem to successfully make a connection after 30 seconds. I should also disclaimer that I only use it as my backup data connection in Malaysia. I only use it when my free unifi SIM is unable to connect to a local network, which tends to happen around KLIA. For Xi'an, I'll give it a 8.5/10. I'm bolding it because this is significantly better than my experience of using it in Shenzhen. 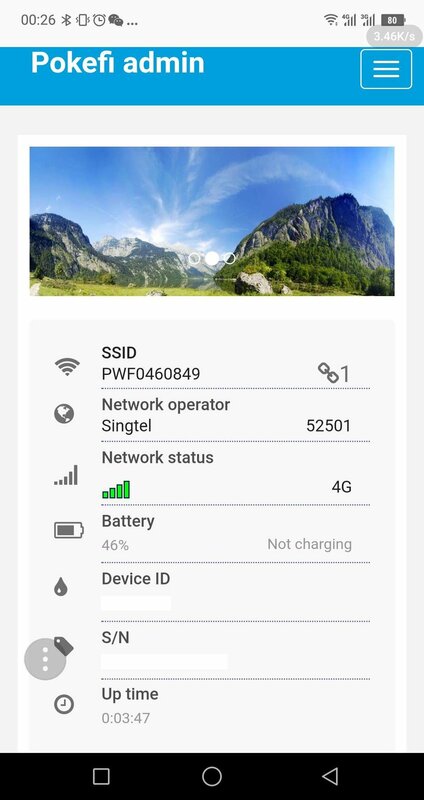 I found that Pokefi was consistently able to connect to local networks within an acceptable period of time (30 seconds) and it also worked quite well with my VPN. For context, I was in Xi'an for 3 days. In Harbin, I'll also give it a 8.5/10. However, I did not use it anywhere near as often as I did in Xi'an purely because of the weather. This is because using your phone outdoors in Harbin's freezingly cold winter is a chore. You don't want to have your hands exposed for too long, and it's pretty hard using the phone with a thin glove on. There's also a concern of the weather causing the battery of either your phone or Pokefi to freeze up, which actually makes it unusable. For context, I was in Harbin for about 40 hours. HKD$990 - The SmartGo Office in Tsuen Wan, Hong Kong. Address: A1 15F TML Tower, 3 Hoi Shing Rd., Tsuen Wan. Opening Hours: 9:30-12:30, 14:30-18:30. Closed on weekends and Public Holidays. I recommend you reach out to them on Facebook first to ensure they have stock. HKD$990 - In-flight on a Cathay Pacific flight - hopefully they have stock! Carousell/other resellers - Depending on where you live, this may or may not be an option. In Singapore, there are sellers selling the device for $195+ SGD, which equates to ~HKD$1107+ based on today's xe.com rates. HKD$1190 Sound & Vision shop @ Hong Kong Airport, Terminal 1, located at Arrivals near 7-Eleven, in between Arrival Hall A and Arrival Hall B. Unsure of opening hours. HKD$1318 delivered worldwide on their official website. The most accessible option is obviously the last - but is also the most expensive. If you happen to be flying Cathay Pacific or swinging by Hong Kong (or have a friend who is willing to help), HKD$990 will be your cheapest option. The Tsuen Wan office is quite obscurely located and is a bit of a trek. Personally, I decided to do it and saw it as an adventure to see a part of Hong Kong I hadn't been to before! I spoke to the staff member at the Tsuen Wan office primarily in Cantonese, but she seemed to have some basic English up her sleeve - enough to be able to transact with someone wanting to buy the device and provide basic troubleshooting/instructions. She was also very friendly. In the interest of keeping the length of this post a little shorter, I will refrain from going into too much detail of the alternatives. Very reasonably priced data, but this SIM can only be purchased in Singapore (or on Jetstar Asia flights) and is obviously not as sharing friendly as a dedicated WiFi Modem device. I do not know much about this device and haven't been able to locate many "personal" reviews (except this? ), but it seems that their data packages are more expensive. This reviewer also reviewed Pokefi and seems to prefer GlocalMe, but the data packages are too expensive for my liking. I spotted this in Hong Kong Airport, Terminal 2, but did not have time to stop and look. I instead took note of the name of the product and remembered to look it up. However, there is hardly any info whatsoever. I can't even find the prices of their data packages, but as a concept as a service, it definitely looks promising and appears to be the most comprehensive, claiming to support roaming in 200+ countries. Update: 20 January 2018 - I have noticed Arrture members can actually get this SIM (with one day free unlimited usage) for free from (certain?) Plaza Premium Lounges. I presume this is a short-term deal and I am not aware of when this expires. My personal experience is that this was given to me free from Plaza Premium Lounges at KLIA2. This appears to be the European equivalent of the StarHub SIM and supports 71 destinations. The reach in Asia is more limited than StarHub, hence why I've called it the European equivalent. Definitely looks like a good option particularly for Europe travel. I think there is a lot of potential in this device, and based on my early experience, I am quite satisfied. I know my Shenzhen review of Pokefi is not exactly a glowing reference, but I suspect (and hope?) it is related to China's stricter controls over.. everything? One thing's for sure - the next time I go to China, I will most likely attempt to purchase a StarHub Happy Roam SIM which was my previous favourite travel data accessory. For China specifically, not having to use a VPN will be extremely convenient and I believe (and hope) that having an actual SIM card in my phone will deliver a better experience. It definitely won't be better value than just using Pokefi and sharing it, but I certainly hope it will be more stable. I believe the per GB rate is unrivalled. HKD$120 for 5GB is unheard of, and the 2 years expiry is absolutely fantastic. This is without even considering that this is ultimately a device to be shared - it's a WiFi modem; not a SIM card! Oh - one random tip - the prices are all charged in HKD. I was told the USD tags are there just to cater to a wider audience and to give some perspective on the cost. For payment of top up, all major Credit Cards are accepted as well as PayPal. I'll post another short post in the future about WiFi Modems vs SIM Cards, as there are pros and cons of each - but as far as I'm concerned, Pokefi will be my primary travel accessory for connectivity in the medium to long-term future... unless something better comes along! !